Beckenham’s history dates back at least to 1086 when it appears in the Domesday Book referred to as Bacheham. This probably means ‘Beohha’s village’ in Anglo Saxon. 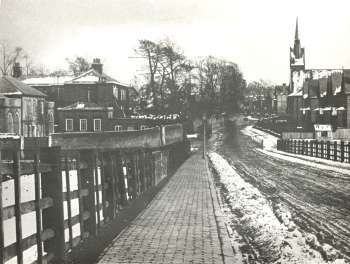 Beckenham soon developed into a significant village administered from the Manor House opposite the church. In 1773 John Cator became Lord of the Manor. When the railway arrived from London in 1857 the Cators, who also had sizable land holdings at Blackheath, realised that their estates were ripe for residential development and soon suburban villas were spreading out from the new station. Built in the style of an Indian colonial town, with wide tree lined avenues and large detached houses in generous gardens, they were designed to appeal to the wealthy, looking for a home out of London but convenient for the city. As this market became saturated, the financially astute Cators turned to building smaller properties. Retaining the freehold, they were able to keep control of the development of a sizable part of the town. Further east, the 1858 opening of Shortlands station on the borders of Bromley encouraged building, commencing in 1863, on the lands of nearby Shortlands House. The opening of Clock House station in 1890 encouraged the building of the estate of the same name filling the area to the west of Elmers End with the type of small terraced houses discouraged by the Cators, while the break up of the Kelsey estate from 1911 gave rise to modern housing south of the High Street between the wars. At the same time H & G Taylor, a Lewisham company began to build Park Langley on land they had acquired from the Goodharts of Langley Park in 1908. An up market development, it continued to grow into the fifties. The electrification of the Hayes Railway line in 1926 encouraged development in the Eden Park area and by 1935 the town was sufficiently developed for a successful application for borough status to be made. Following the war, much of the Cator estate was redeveloped with modern houses and flats. This process has continued elsewhere in the town although the Clock House area and most of the between the wars housing remains as built.